00:42:00 Makes 4 servings, 1 sandwich (290 g) each. Makes 4 servings, 1 sandwich (290 g) each. Bored with basic burgers? 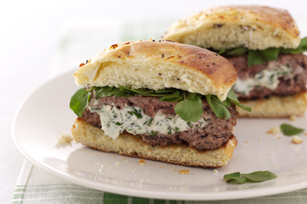 Give our Herbed Cream Cheese-Stuffed Lamb Burgers a try. Filled with cream cheese, chopped chives and fresh parsley, these lamb burgers are anything but ordinary. Mix cream cheese and herbs until well blended. Roll into 4 balls; flatten each into disk on sheet of waxed paper. Refrigerate 15 min. or until firm. Combine meat, Worcestershire sauce and pepper; shape into 8 thin patties. Top 4 patties with cream cheese disks; cover with remaining patties. Press edges together to seal. Heat oil in large skillet on medium heat. Add patties; cook 5 to 6 min. on each side or until done (160°F). Serve in buns topped with watercress. Top cooked patties with slivered red onions or thin plum tomato slices in addition to the watercress. Use the tines of a fork to seal the edges of the patties. Serving Size Makes 4 servings, 1 sandwich (290 g) each.